Designers have two different starting points when conceiving new structural forms, top-down and bottom-up. Top-down is the classical, Cartesian-center technique of picking the overall shape first and then filling in the parts. Bottom-up, as the name implies, is the opposite: it starts with geometric components as the initial building blocks. Through repetition and variation according to logical rules, they grow to define larger systems. Bottom-up conceptual approaches are found throughout other art disciplines, but it is still rare in architecture. But Sung sees bottom-up as up and coming. Sung recently taught a workshop at Cornell, where architectural students experiment with generating highly complex 3D forms by automatically repeating patterns of components. The workshop uses the newly released application Grasshopper, a parametric plug-in for Rhinoceros’ 3D NURBS modeler. 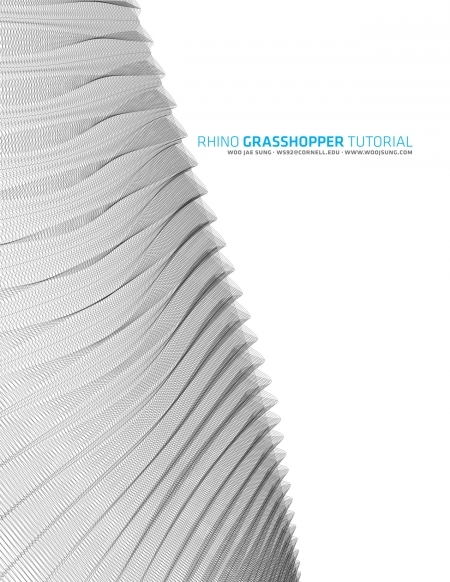 Sung publishes his own Grasshopper Tutorial, a primer of getting started in the program, for Rhino users everywhere. The tutorials are free on his blog, www.woojsung.com. Sung says the tutorial content comes out of his own experiments in the software, where he tests his bottom-up theories and learns how to translate them into fully realized computer models. “Before the advent of parametric and generative tools, doing bottom-up design was a time-consuming, painful, and rigorous process,” says Sung. “Changes in parameters or relationships between objects meant that entire model should be done manually from the scratch.” He cites works by Eduardo Arroyo or Ciro Najle as examples of bottom-up processes without computer aid. But with generative digital tools that can easily program geometric patterns, Sung and other a bottom-up artists now have a clearer opportunity to flip the script, so to speak, on the dominant paradigm of top-down thinking. 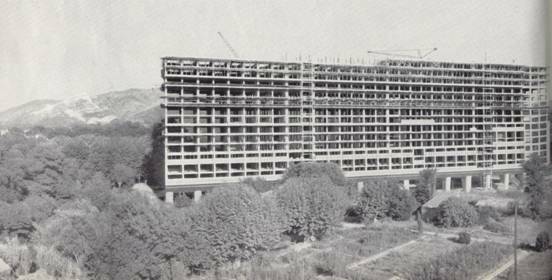 Housing Block: Construction of Unite d’habitation in 1945. Le Corbusier’s housing layouts were heavily prescribed by a top-down Cartesian framework. Tradition design tools, construction methods, and habit of mind have reinforced top-down thinking. Look around at the environments where we live and work, and it is obvious that most of them began life as T-squared outlines on the drawing board. Sung is starting to see generative output enter into real-world projects, although their application seems to be limited to textural additives, in the form of “crazy” contemporary ornamental patterns on wall panels of a building that was otherwise produced through top-down processes. Ground rules– Woo Jae Sung’s bottom-up apartment alternative begins with a group of circles nest inside an acute angle. The circles can be rearranged within this boundary in different configurations. A wider angle grows the area of the circles. 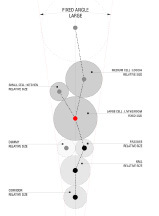 Sung demonstrates that bottom-up design can go quite a bit deeper, to the point of defining the entire building form. Recently, Sung explored the design of the Unite D’habitation, Marseille by Le Corbusier. Considered iconic in modern architectural history, the 1945 housing block became a template of today’s urban living. The cylindrical re-conception allows for varied room configurations based on a set of basic geometric rules. 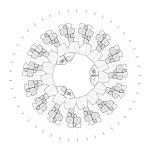 Like cross-sections of a tree, the roughly circular building floor plans resemble one another, but are also each unique. As the floor layouts vary in form, the vertical supports of the cylinder gently curve back and forth, giving varied character to both the interior and the exterior. Sung found the optimal solution for ten different floor plans in Grasshopper. “I think this shows a different application of the parametric tool on architecture other than just wall patterns or mullions,” says Sung. 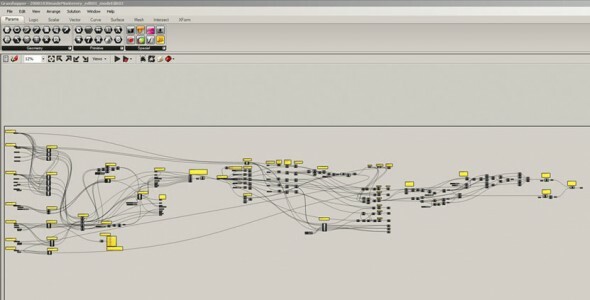 “Here the parametric tool is playing active role in generating form. One of the appeals of a layered bottom-up process is that it is closer to that of natural organic growth, and so are the results. Biological complexity is all bottom-up: from molecules to cells, cells to tissues, and tissues to organisms. Berkeley professor Christopher Alexander has literally filled volumes with good examples of form from nature and vernacular architecture, and bad examples from contemporary buildings in his book series, “The Nature of Order.” He argues that top-down architecture, rooted as it is in abstract images and Cartesian grids, ends up lacking some hard-to-articulate quality. “Soul” might be a way to put it. In terms of experience, spaces created by top-down structures of mass-produced components can feel impersonal, cold, or “dead,” while buildings made through more organic generative methods seem to resonate as friendly, warm, and vitalizing. A series of transformations within Grasshopper turns each angle into apartment units. A Voronoi algorithm turns the circles into room shapes; each ring design represents a unique high-rise floor plan. Generative modeling tools like Grasshopper has opened the door to bottom-up design in architectural studios, but the remaining shift in perspective lies in construction site. Concrete and steel – the cast-mold and frame-surface systems that now dominate construction – keep architects snapped into the grid. In making the quintessential top-down structure of Unite d’habitation, Le Corbusier drew inspiration for its structural system from ocean liners. In what might be the future trend in 21st century architecture, bottom-up designers might look to the jet. Aerospace parts exhibit strong, complex forms without the use of cast or frame systems. Bottoms Up - The alternative housing complex model fleshed out in Rhinoceros after form-generation in Grasshopper. The slight variation in floor plans leads to organic curvatures to interior and exterior structural elements and a housing “block” where no two units are the same. Architect Woo Jae Sung is a graduate of Yonsei University, Seoul, Korea, and Cornell University’s School of Architecture in New York. For more of Woo Jae Sung’s architectural examples and the latest edition of his Grasshopper tutorial, visit: www.woojsung.com. 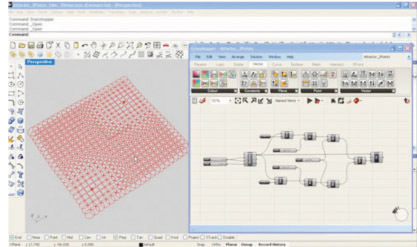 For designers who are exploring new shapes using generative algorithms, Grasshopper™ is a graphical algorithm editor tightly integrated with Rhino’s 3-D modeling tools. Unlike RhinoScript, Grasshopper requires no knowledge of programming or scripting, but still allows designers to build form generators from the simple to the awe-inspiring. For more information, please visit: www.grasshopper.rhino3D.com. One of Keisuke Toyoda’s recent experiments in generative modeling “samples” a work of another: the Beijing National Stadium by Herzog & de Meuron. 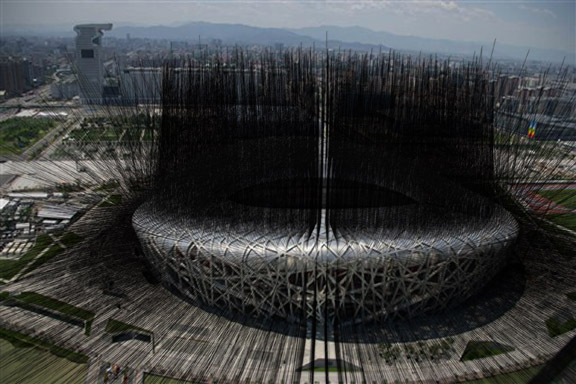 His rendering shows the Bird’s Nest of last year’s Olympics strapped down by what appear to be tens of thousands of steel cables, which shoot up to over twice the height of the stadium roof. Toyoda is one of the founding partners of the Toyko-based Noiz/Architecture, Design & Planning, a firm whose name also invites a comparison to the world of audio. According Toyoda, the connotation was intentional. Bold debuts of musical styles, whether a ballet by Tchaikovsky or an album by Metallica, have always been called noise. 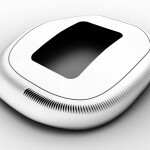 In the same spirit, the designers at Noiz look out for new 3D forms that challenge the conventions of its audience. The remixed Bird’s Nest seems so novel — so noisy — because its textures are unfamiliar. The word whiskery is not often ascribed to buildings. The image is also an example of how a small conceptual shift in 3D modeling is now producing a mother lode of innovative forms for studios like Noiz in search of the unexpected. Surprisingly, Toyoda only had to model one strand to generate the overwhelming intricacy seen in the remixed Bird’s Nest. 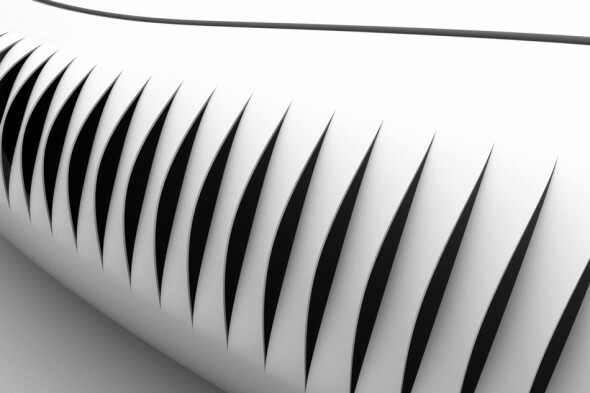 This was achieved in Grasshopper, a new plug-in for the 3D NURBS modeler Rhinoceros. Grasshopper splits the view of a 3D composition on to two different conceptual levels: the familiar 3D visual model next to a display of the logical model of the design. This automation power has long been available to programmers, but scripting was a long and tedious affair that was too far removed from visual feedback. 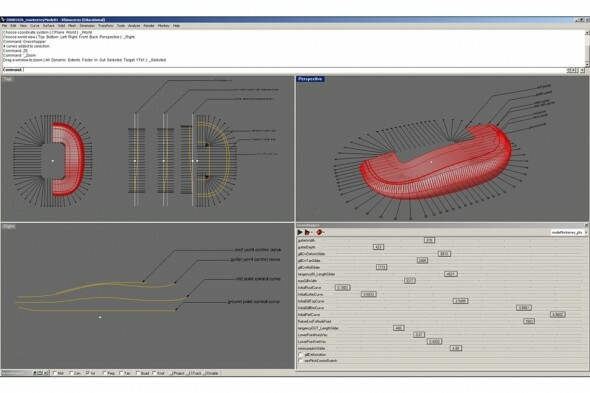 With the Grasshopper interface, designers with no programming experience can play around with the logic just as easily they would the 3D model. Composition then jumps up a structural meta-level – not just drawing shapes, but assigning behavior to shapes. 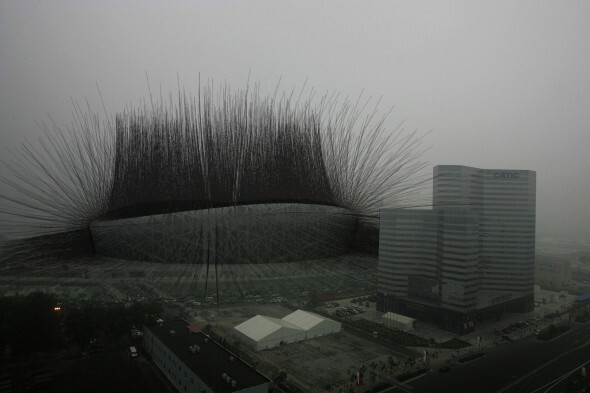 The Birds’ Nest remix was the end point of that particular experiment, but others become the creative starting point in real architectural projects at Noiz. Another experimental inspiration was the spirogyra, a kind of microscopic green algae known for its helical structure and luminous green color. 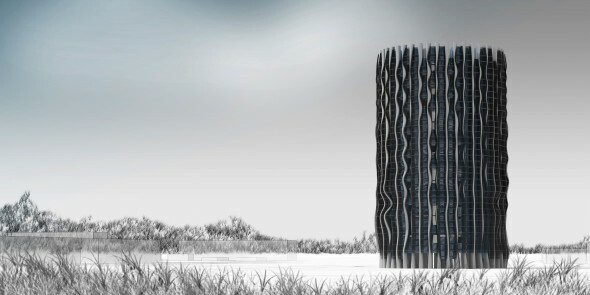 Not long after Noiz designers re-generated the form in Grasshopper as a modeling puzzle, the team found a home for it as a dominant motif for the Hongqiao Office Building (HOB). Green-tinted spirogyra forms act as vertical supports and carriers of the ventilation system. The Noiz team developed another project, the exterior of the GoodTV headquarters, almost entirely in Grasshopper. At night, the Christian TV station and an urban church in Taipei, Taiwan, transforms into a four-dimensional light show. The wall facing the highway features a field of glowing antennae of various lengths. A three-dimensional surface and the outline of the cross are slowly revealed to passing motorists. “The overall presence of a cross is meant to be very vague and ethereal, like a mist in the air,” says Toyoda, who took influences from contemporary artists like Jim Campbell and Michal Rovner, whose images are kept intentionally blurry or ambiguous. Chasing the unexpected is the standard course at Noiz, as generative modeling is fast becoming a permanent fixture in its process. The design team now is in the habit of remixing of their initial ideas. New Forms of music in their infancy has often been taken as noise. The name of Noiz / Architecture, Design & Planning takes its cue from developments in music history, as an everyday reminder of the firm’s commitment to unique and insightful design solutions. Founded by Keisuke Toyoda and Jia-Shuan Tsai in 2006, Noiz brings together their joined experience in institutional, commercial, and residential design in Asia and the United States. For more examples from Noiz, please visit: www.noizarchitects.com.